I spent a lovely Sunday morning touring Alexandria Capital Bikeshare stops with the Alexandria Spokeswomen, a women’s bicycling group. 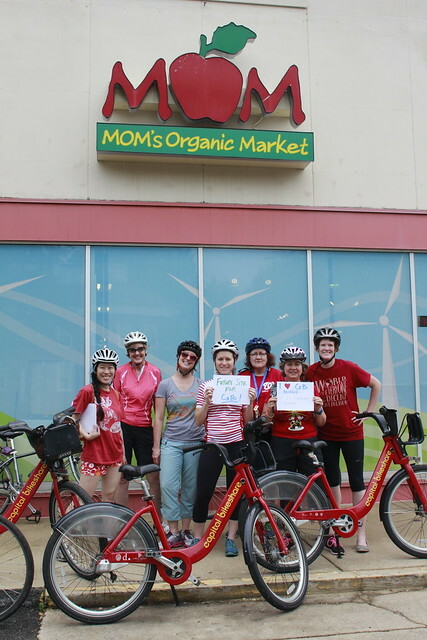 I met them last month at Alexandria’s Earth Day event and immediately liked them on Facebook so I could be informed about their rides and events. 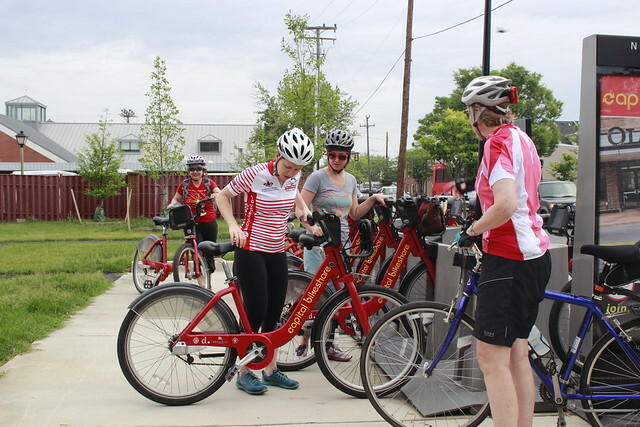 The Spokeswomen met at the Capital Bikeshare located at 600 North Henry Street in Old Town. 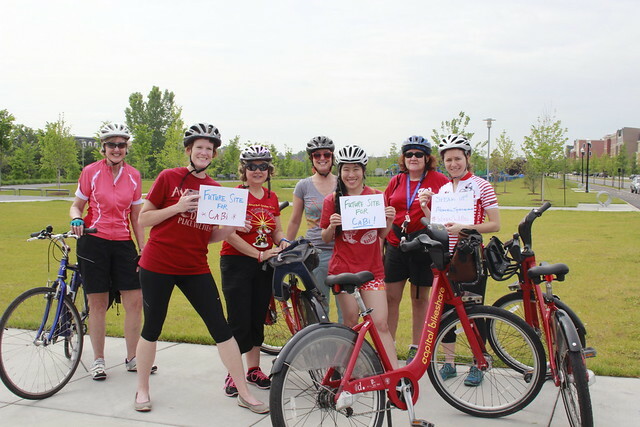 Several riders used the Bikeshare bikes, although it wasn’t a requirement. Capital Bikeshare, aka CaBi, always seemed a mystery to me. This ride turned out to be an informative walk-thru of how easy and convenient it actually is. The best deal for locals is to buy a yearly pass for $85 and use the bikes whenever you want. The key is you have to check into a Capital Bikeshare station every 30 minutes to avoid additional fees. This is not difficult as there are so many stations in the Washington area. It just takes a little planning and knowing where the stations are (yes, there’s an app for that). Check out their website for easy to follow instructions https://www.capitalbikeshare.com/. 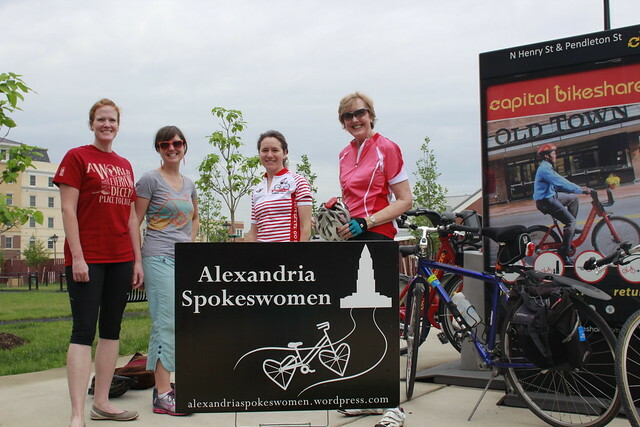 On my ride with the Alexandria Spokeswomen, we visited a variety of Capital Bikeshare locations in Alexandria and a few future locations. Here we stand at a future site in front of MOM’s in Arlandria. 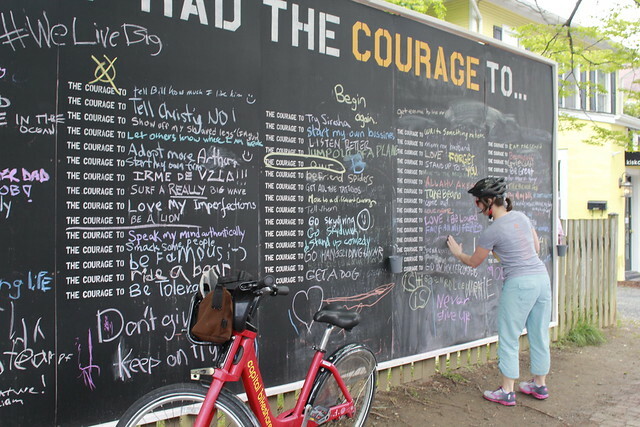 We then rode to another future site on Potomac Ave.
At the Del Ray Location, we visited the the now world-famous Courage Wall. We hope everyone has the “courage” to use Capital Bikeshare. 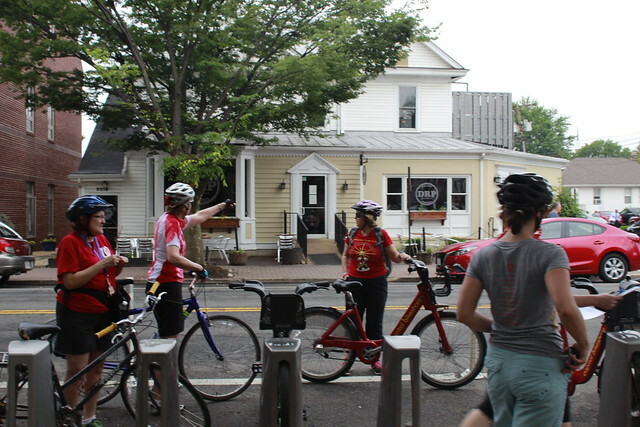 There are special deals for being a member too — during the month of May you can receive a 10% discount at Del Ray Pizzeria by presenting your Capital Bikeshare fob. We ended our trip by circling back to Braddock park and enjoyed donuts together at the picnic tables. All in all, I learned a lot about the ins and outs of Capital Bikeshare alongside lovely company and good exercise. I would recommend trying Capital Bikeshare, it is a great option for running errands around town or as an everyday commuter bike.